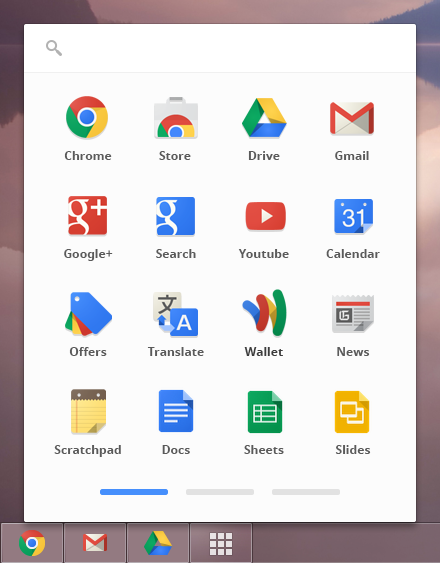 , you can try the Chrome app launcher--a dedicated home for your apps which makes them easy to open outside the browser. This is the same experience as the app launcher on Chromebooks, but for other platforms. It’s available on Windows now, and will be coming to Mac OS X and Linux soon. You’ll get the app launcher as an icon on your Windows taskbar the first time you install a packaged app. Chrome packaged apps are not yet searchable on the Chrome Web Store - but you can build your own packaged app, upload it to the Chrome Web Store and access it via its direct link. 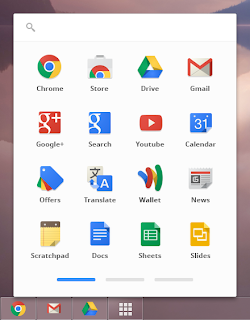 Try out the app launcher and let us know what you think. If you have any questions or comments, you can use Stack Overflow or chromium-apps. File your bugs and feature requests here. Today, on the Chrome dev channel for Windows, you can try the Chrome app launcher--a dedicated home for your apps which makes them easy to open outside the browser. This is the same experience as the app launcher on Chromebooks, but for other platforms. It’s available on Windows now, and will be coming to Mac OS X and Linux soon.